Quiltville's Quips & Snips!! : Blue Ridging to Beat the Band! Chain those 4 patches in the same direction only! Spin those seams in the same direction! Trim those dog ears – ALWAYS! Quilt Police? NO—just some helpful “makes sense!” stream-lining for great results and less stress and much more quilty-pleasure! Our last day of seminar in Amherst, NY with a great group of wonderful ladies ---many who had been with me all week long. I have the powers-that-be to thank for putting our most relaxing class as last in the line up. 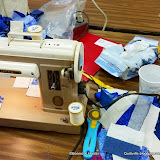 Many of us who were energinzed and raring to go on day 1 were dragging our tails by day 4---there was SO MUCH SEWING going on all through the week! But these gals are troopers, and you’ve got to appreciate the smiles, the making of new friends, the seeing of folks you hadn’t seen since last year’s seminar and all of the catching up, Americans and Canadians alike. Jean’s machine doing double duty! I have a couple of machines, my 301 included..that even though I release the clutch in the handwheel to wind a bobbin, the needle goes anyway ---So – why not put a second spool of thread on the lower spool pin, and just wind an extra bobbin while I sew? Longarm machines do this…why didn’t I think of doing this with my vintage babies? HA! Does this look like a color mess? It’s EVERYONE’s blocks all coming together so we can try different layouts with the blocks. This block is shaded much like a log cabin block, so you can lay these blocks out in any log cabin design as well – try it! Play with the blocks and don’t stop playing until you have found something that you really love…then sew it all up into a quilt top! You'll find the pattern for Blue Ridge Beauty in my book Adventures with Leaders & Enders. I’m headed home today. I’ve got Monday and Tuesday at home to pull it all together again and head to Michigan early Wednesday morning. I need some time with my family, so we won’t be doing Quilt-Cam this week – but we will when I get home from Michigan, so keep that in mind! My sincerest gratitude to the Amherst Museum Quilters ----you’ve shown me a wonderful time and the greatest hospitality and I am so thankful. It’s been a wonderful visit and I hope to see you again in the future! I’m packing up my bags, grabbing some breakfast, and heading to the airport…. Have a restful Sunday, everyone! I found out about winding a bobbin while sewing back a few years. I can do it on my Kenmore and Janome but not on my electronic Husquavarna. I have been told it is a great way to wind a bobbin as it is not wound too tightly that way. Safe travels as you head home to your family! Just watching QUILTCAM, reading your books and blog, I have learned so many hints/trick that the list is very long. THANK YOU. Until youo showed us all to work 2 blocks or pieces at a time instead of 5-6 feet of HSTs etc, I didn't like working the string or line type piecing. Now I love see the block as the become complete 2 at a time. Hope you enjoy your time at home or at the cabin. Gorgeous weather here in the Foothills of the Smokies on the TN side! Hi Bonnie - looked through all the pictures of the blocks, and they're GORGEOUS! Great job to everyone! Thank you Bonnie...you know why! Actually I love the colors all gathered together.... it's great. And talk about scrappyness! I was thinking it looks like it was supposed to be that way. Great idea filling bobbins while sewing, nothing like doing two things at once. Terrific!